When winter weather arrives, getting out of bed and leaving the warmth of your house becomes much harder. 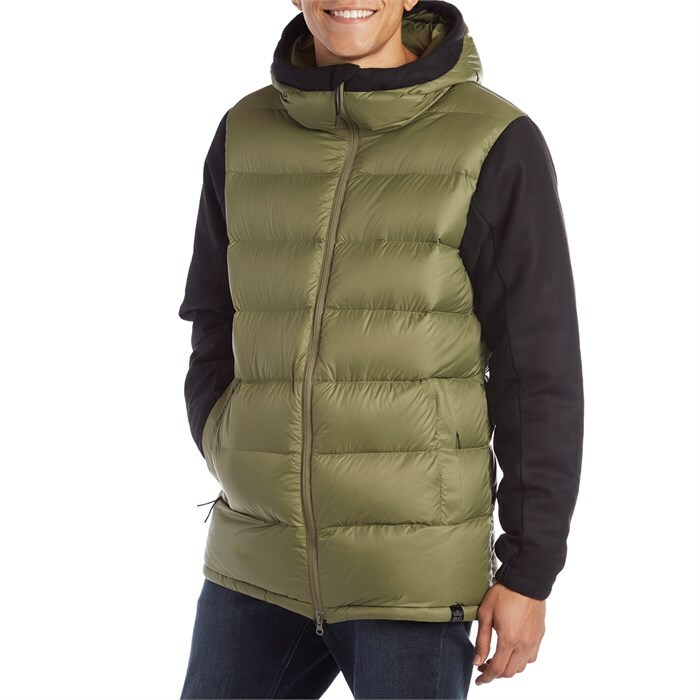 With the evo Ballard Down Jacket, brave the cold as if you'd taken your comforter with you. Packed with 800-fill power RDS down throughout the hood and body, plus 200 grams of synthetic insulation in its toasty wool sleeves, this jacket delivers a swift, Chuck Norris-like kick-start to an otherwise freezing cold day. Throw on the ridiculously warm, wool-accented, premium construction of the evo Ballard Down Jacket and reap the benefits of your sleeping bag with some fresh style to boot. Responsible Down Standard (RDS)  The Responsible Down Standard ensures that down and feathers come from ducks and geese that have been treated well. This means enabling them to live healthy lives, express innate behaviors, and not suffer from pain, fear or distress. The standard also follows the chain of custody from farm to product, so consumers can be confident that the down and feathers in the products they choose are truly RDS.